Single Google account can be used to access different online services offered by Google. There is a maximum limit on amount of files, documents and images that can be uploaded for free. Each Google service has different limit of free maximum storage. You can easily check on current storage usage details of different Google products. 1. 1 GB for Picasa Web Albums photo and video storage. Virtually Picasa offer unlimited photo and video storage, because photos upto 2048 X 2048 pixels and videos upto 15 minutes are not counted within 1GB free storage limit. This also include photo and video media content posted on Blogger, Google+ and Google Maps. 2. 5 GB for new Google Drive service allowing you to store your files, photos and documents on the cloud. Google Docs are also counted within Google Drive now. However, documents converted into Google Docs format are not included in free 5 GB limit. 3. 10 GB for Gmail messages and attachments is free allocated storage space. Recently, Google bumped up free Gmail storage limit from 7 GB to 10 GB. 4. Unlimited free storage for Google+ service. You can upload unlimited amount of photos and videos using Google+ service. However, only condition that Google + will automatically resize photos to 2048 pixels. Also, only videos up to 15 minutes in length are included in free unlimited storage quota. 1. Open Storage settings webpage at google.com/settings/storage/ URL. Login into your Google account (if you are not already logged in) to see status of storage capacity being used by different services accessed with that Google account. 2. 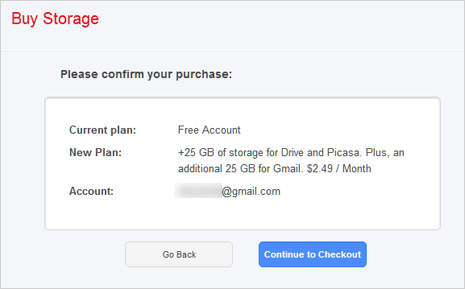 Under your current plan, you should able to see percentage of used storage for different Google services including: Gmail, Google Drive and Picasa Web. 1. If you are running out of free space, you can easily buy more storage for your files, images, videos and documents on different Google services. Open Storage settings webpage at google.com/settings/storage and login into your Google account. You will see various storage upgrade options including 10GB, 25GB and more. 2. Each storage plan has monthly price as yearly plans are not available as of now. Also when you buy more space by selecting either of upgrade plan, you get bonus of Gmail storage automatically increased to 25GB limit. There are number of plans available including: 25GB, 100GB, 200GB, 400GB, 1TB to 16TB. 3. To continue, click Choose this Plan button next to upgrade plan of your choice. Then you can proceed to checkout using Credit Card via Google Checkout. Within 24 hours newly purchased additional storage is added to your account.